Some brands I love more than others and some items don't need to be anything special. These are just my go to crafting items that get me through the day, are worth spending money on and I have found myself using more than once or twice. Aleene's Tacky Glue, this is like the Frank's Red Hot of crafting. I use this sh*t on everything. 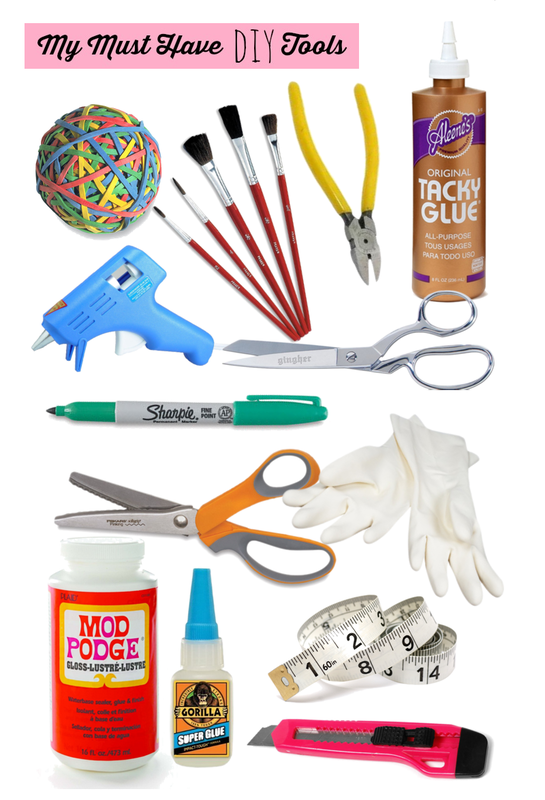 Crafting and sewing both have used for this all purpose glue. Whether it's paper crafting, repairing a small item or working on a hem, I love tacky glue long time. Gingher Fabric Scissors, now since I am a sewer these come in handy more often than not because they are hella sharp. These will slice down a yard of fabric quicker than you can say "stitches" but I find that even with non-sewing projects, where I am still cutting fabric (hello, rug braiding?) these scissors have been useful. Pinking Shears, these are not unlike the fabric scissors in that they are useful for a variety of projects but the difference is that they provide a jagged edge that helps Mama stop the fraying. Hot Glue Gun, I use my super cheap hot glue gun for tons of stuff and it has last me years. Christmas bows, wedding crafts, shower favors, this bad larry comes out to play all.the.time.... and burns me nearly every time. Rubber Bands, handy to have around, I use rubber bands when I am dyeing projects as well as for keeping things together. I am always amazed when I think to myself, "Hey, where is my rubber band ball?" Variety of Sizes: Paint Brushes, not just for literal painting, I use affordable paintbrushes to apply glue and modge podge to keep my hands clean. Modge Podge, I use this mostly for decoupage but I have also used this to add texture to my paints almost like a modeling paste. Additionally, this can be used as glue in a pinch and provides hours of fun using the phrase "I Modge Podged". Gloves, keeping my hands clean for years since I spray pant, tie dye and do stenciling. Super Glue, need to fix the heel of your boot or put together that wooden "Joy" sign that fell off your mantle? Super glue that, please. Razor Blades, I bought these originally for my handbag making class but have come in handy for sharp edges, quick cutting and precision. Soft Tape Measure, not just for sewing, you would be surprised how often you need to measure something not related to garment making. I find I use my soft tape measure more since it has more give and I am able to maneuver it better. What are your favorite tools for creating? remembering to use. No more fingers stuck together or gold hands! Cute and super handy to have!